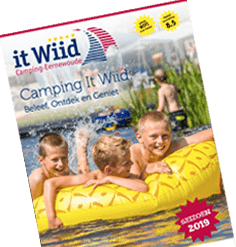 Home - Camping "It Wiid"
At campsite It Wiid in Friesland you’ll find all you need to experience an unforgettable holiday. Our 28 hectares site is set right in the middle of De Alde Feanen National Park. You can pitch your tent, park your caravan or campervan, or rent a holiday home in our holiday park It Wiid. Our campsite has 370 spacious pitches, including a large number right by the water’s edge. There are various amenities including an heated outdoor swimming pool, a playground, and a football field. It is also possible to rent sailboats in various sizes, motorboats and canoes to explore Friesland from the water. Do you care for more luxury and comfort? What about a holiday home right by the water’s edge? The campsite itself offers spacious holiday homes suitable for 6 or 8 people. The layout is the same everywhere. The homes are situated around a harbour. Some of the homes are beautifully located directly at the Fokkesloot. Buitenplaats It Wiid, next to the campsite, has luxury holiday homes suitable for 4, 6, and 8 people. Practically all homes are located right by the water’s edge and have their own jetty. 100% satisfied guests, that is our mission! We had a beautiful holiday! The recreational team was great and the children had a lot of fun in the swimmingpool. We recommend to rent a boat. The area is beautiful! We had a lovely holiday and will come back again! Copyright © 2017 It Wiid.